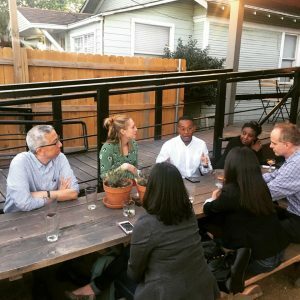 Each month, an ONA Local group chooses a journalism topic and invites our entire network of communities to join them in hosting discussions on that theme. This month, ONA Dallas/Ft. Worth nominated Self Care as the theme. ONA DFW Leader Hannah Wise wrote about how she and her community approach this issue. It has been one year since five officers were ambushed in downtown Dallas and the gunman killed by explosives attached to a bomb-detonating robot. It was the most harrowing day in the city’s history since President John F. Kennedy was assassinated in Dealey Plaza. In the months since July 7, I have spent a lot of time thinking about how to take care of myself, my colleagues and the community that my journalism serves. That desire to care for my colleagues and the community has set the tone for much of the programming for ONA Dallas/Fort Worth. Sure, we’ve had happy hours and we’ve talked about new tools to share news. But most importantly, we have come together to support one another. The importance of asking how your community members are doing and genuinely caring about their responses cannot be overstated. Trauma, grief and stress are all internalized and manifested differently. It is hard to know how a friend or colleague will react to an event, but we can all focus on showing compassion to one another. I remember a lot from the night of July 7, but I will always remember the feeling of immense relief I felt when Mike Wilson, editor of The Dallas Morning News (The News), stopped me before doing a TV hit to make sure I had eaten something. I hadn’t. He handed me peanut butter crackers. Then he took a picture of me that I could send to my parents so they’d be certain I was alive and working in the newsroom. That moment was maybe two minutes long, but it felt like an eternity. ONA Local groups can serve that same purpose of offering a momentary reprieve from the chaos. The social events especially afford us the time to be genuine and purposeful with these small interactions. During our group’s events following last year’s shooting, we opened them up as general happy hours. There was no set programming — we only asked that attendees connect with someone else in the community. If someone wants to share their job experience, awesome. A student has questions about how a veteran reporter landed their first job? Even better. Above all, offer a designated time and place for everyone to be able to breathe and reflect with other journalists who get what it is like to run toward the crisis, not away from it. In the weeks that followed the July 7 shooting, editors at The News reminded staff that it was OK to not feel OK. Modeling that was so critical to my own mental health and self-care. The DART Center for Journalism and Trauma has an excellent tip sheet for managers about this. Managers ensured that work was structured and organized. Time away from the newsroom was a clear priority. Food was everywhere. And there were regular reminders that it was OK to not feel normal. What our community experienced was not normal. Especially after the national media left town, there was still work to be done, and our readers needed us. Being able to acknowledge as a group that this was not “business as usual” felt important. At least in my case, it allowed me the freedom and peace of mind to actually ask myself what I needed. I like structure and organization. I thrive on to-do lists. But after covering the chaos of July 7, the structure I’d built for myself felt isolating and overbearing. I don’t know that it was a conscious decision but I fell into embracing more spontaneity. I maintained some of my schedule — I obviously showed up for work, for instance. But, I dug deeper into my yoga practice, focused on finding small moments of joy and started stitching my Sew Many Comments project. Ultimately my year-long experiment in self-care was about finding things that felt good. I wrote stories that were important to the community, but I focused on facilitating conversations that would lead to my friends and colleagues in our local chapter finding fulfillment. Strive to make whatever you do be something that your community wants to participate in, and don’t be afraid to ask them what that looks like. The beauty in community-based journalism is the diversity of interests and experiences. I hope that your ONA Local community can find the best ways to celebrate and value all of the individuals who make the news you use. Hannah Wise is the Engagement Editor at The Dallas Morning News. She oversees the newsroom’s social media strategy and seeks ways to cultivate conversation around The News’ journalism. Previously she worked as a breaking news reporter covering politics and a UI designer for GuideLive, The News’ entertainment vertical. Wise is the ONA Dallas/Fort Worth co-founder and president. She is the stitching maven behind behind the viral Instagram account @sewmanycomments, where she doesn’t read the comments, but sews them. She is a graduate of the William Allen White School of Journalism and Mass Communication at the University of Kansas, where she studied journalism and Germanic languages and literature. In the fall she will begin her master’s in journalism at the Mayborn School of Journalism at the University of North Texas while continuing to hustle for The News.